The former monastery Kloster Wedinghausen in Arnsberg (a small town in western Germany) contains in it‘s courtyard the so called Lichthaus – a multifunctional architectural object which was built in course of the monastery renovations. Since 2009, the construction mainly built with glass and concrete, is used as an exhibition space. 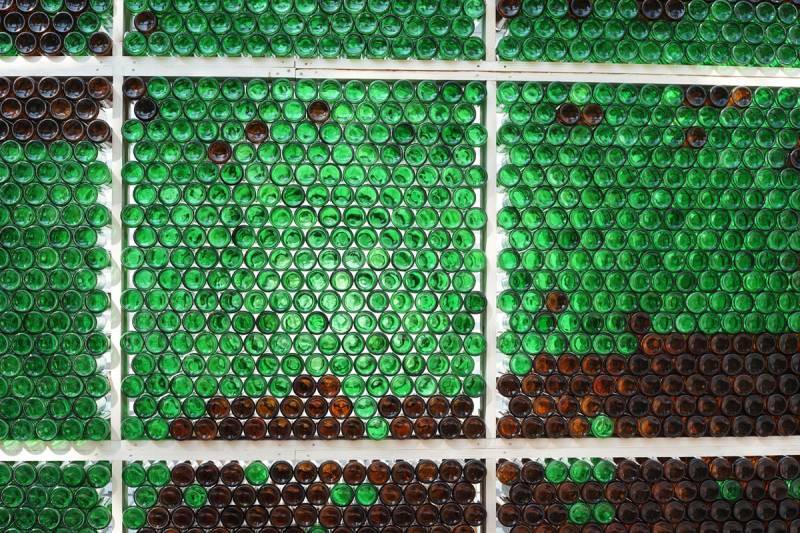 In the installation prima materia, which I developed specifically for this building, I stacked 6000 empty glass bottles to a monumental wall of 24 square meters. This wall divides the Lichthaus in two parts: While the sun is exposing one side at daytime, floodlights illuminate the other side of the wall at nighttime. The raw material of my visual and conceptual investigation is an everyday item, an empty glass bottle. While developing the installation I was very interested in the concept of transforming objects, especially in the tradition of alchemy. This led me to the term Urmaterie (engl. first matter, latin prima materia). This Term originates from the Aristotelian thoughts about the constitution of the world of things. While for Aristoteles the prima materia was a construct of notions, Alchemists in medieval and early modern times tried to investigate how to distill first matter from objects and material actively. The idea of the deconstruction of meanings took an active part in the conception of the installation. I consider the installation prima materia as a photograph since it is dealing with fundamental aspects of photography like light and transparency of the carrier material.